PIGEON FORGE, Tenn. (Jan. 31, 2017) — The Fee/Hedrick Family Entertainment Group is proud to present the return of “Magic Beyond Belief™ Darren Romeo” in the ALL NEW Magic Beyond Belief™ Darren Romeo Theater, 2135 Parkway in Pigeon Forge (across the street from “The Hatfield and McCoy Dinner Feud™”). Co-owners David Fee and Jim Hedrick, of the Fee/Hedrick Family Entertainment Group, will premiere the new 525 seat-theater on Friday, March 3. Romeo, an internationally acclaimed magician, has been the star of Fee/Hedrick’s “Magic Beyond Belief™ Darren Romeo” show for the past two years in a matinee show at The Smoky Mountain Opry™ Theater. Romeo will now star in his own show in a magical evening time slot at the new theater. This full, two-hour “Magic Beyond Belief™ Darren Romeo” production will feature stunning illusions, mind-boggling special effects, parody celebrity impersonations, hilarious comedy, vocal performance and a huge tribute to the magicians who inspired him the most: Siegfried and Roy and Harry Blackstone Jr. It is a high-energy, fast-faced production. “We expect to invest over $500,000 dollars in theater upgrades to complete the theater with all of the bells and whistles for a truly magical experience,” Fee said. “Two large video screens will complement the show, as well as the glamour of mood-setting lights, engaging music, new elaborate sets, fantastic costumes and state-of-the-art lighting and sound systems.” Fee says the show will leave the entire family spellbound. Romeo, the first and only protégé of Master Magicians Siegfried and Roy, will appear Monday through Saturday, March through October, at The Magic Beyond Belief Darren Romeo Theater. Romeo’s “Magic Beyond Belief™ Darren Romeo” is known for his combination of live singing with the art of magic and illusion for a one-of-a-kind magical performance. Magician of the Year” from the Magic Castle, The Academy of Magical Arts, Inc., the prestigious Merlin Award for “Entertainer of the Year” from the International Magician’s Society and the Milbourne Christopher Award for “Notable Contributions to the Art of Magic” from The Society of American Magicians (SAM). In addition to all of the large illusions people would expect to see on stage from Siegfried and Roy’s protégé, Romeo will perform close-up magic and sleight of hand tricks in the new show as well. Romeo will carry on Harry Blackstone Jr.’s legacy by performing his famous “Floating Light Bulb” Illusion. He is the only magician in the world granted permission from the Blackstone family to perform this tribute. “Magic Beyond Belief™ Darren Romeo” will be performed at 8:15 p.m. on Monday through Saturday. Tickets for the show will be $29.95, plus tax per person and children 11 and under are only $9.95 plus tax per person. There will be a combo deal when guests buy tickets to “The Hatfield and McCoy Dinner Feud™” they will be able to purchase tickets to “Magic Beyond Belief™ Darren Romeo” for $19.95 plus tax per person. For more information visit pigeonforgemagic.com. Pigeon Forge, Tenn., (Nov. 1, 2016) – At the “Hatfield and McCoy Christmas Disaster Dinner and Feud”™ in Pigeon Forge, Tenn., the bitter conflict between the two families continues as neither family stops their feudin’ for Christmas. Back for a sixth season, The “Hatfield and McCoy Christmas Disaster Dinner and Feud” ™ kicked off Nov. 1 and runs every day until Jan. 3, 2017 at 5 p.m. and 8 p.m. nightly, with occasional 2 p.m. matinees. The audience follows the lives of the two clashing mountain clans with their vibrant dancing, foot stomping music and a backwoods decorating contest! Unscrupulous Mayor Timothy O’Reilly (played by Tim Harkleroad) is plotting to steal the Hatfield’s and the McCoy’s land in order to build some time-share property. When the two families discover his plans they drop their feud and band together to get him to come to his senses. The Mayor’s encounter with the Ghost of Christmas past helps him to discover the true meaning of Christmas. Situations include a barn party, a Christmas lighting contest, and some ghost costumes! This approximately two-hour live show offers guests extraordinary country, bluegrass and gospel music. It also features award winning hillbilly musicians, cloggers, and an abundance of country cooking. “This show is something the whole family can enjoy,” Fee said. “Our delicious home-style Christmas feast cooked by Granny includes all-you-can-eat Feudin’ Fried Chicken, Open Pit Pulled-to-Pieces Pork Barbecue, Granny’s Creamy Chicken Soup, Smashed Mashed Taters, Buttery Corn on The Cob, Ma’s Homemade Bread, No Tellin’ What’s In It Coleslaw and Specialty Desserts. A vegetarian option is also available upon request. It is the best dinner in town. Fee stated that guests are treated to a pre-show full of musical Christmas fun before the real show starts. The Hatfield’s and the McCoy’s invite each side of the audience to support “their kin” at the “Hatfield and McCoy Christmas Disaster Dinner and Feud”™ in the legendary hillbilly feud of rival families. For more information about the show, visit www.HatfieldMcCoyDinnerFeud.com or call (865) 908-7469 (SHOW). The Hatfield and McCoy Dinner Theater is located at 119 Music Road between traffic lights 0 and 1 on the Parkway in Pigeon Forge next to the Titanic. Ticket prices for “The Hatfield and McCoy Christmas Disaster Dinner and Feud”™ are $54.95 plus tax and children are $24.95 plus tax. Group rates are available for groups of 15 or more. Fee/Hedrick offers a special combination show deal that gives adult customers the opportunity to pay only $19.95 plus tax for “Christmas at The Smoky Mountain Opry”™ when they buy the world-famous “Hatfield and McCoy Christmas Disaster Dinner and Feud” ™ at the regular price of $54.95 plus tax. With this combo deal, children are $24.95 plus tax for the “Hatfield and McCoy Christmas Disaster Dinner and Feud”™ (up to age 11) and children are free to the “Christmas at the Smoky Mountain Opry” ™. The Fee/Hedrick Family Entertainment Group is one of the largest show production companies in the southeast. The company also owns and produces other major shows in the Smoky Mountain area including: “A Comedy Barn Christmas®”, “Christmas at the Smoky Mountain Opry™, “ “The Smith Morning Christmas Show” featuring the Charlie Bob Smith and “Magic Beyond Belief”™ starring Darren Romeo, (which will reopen in March). In addition, the company also owns Chef’s Catering. 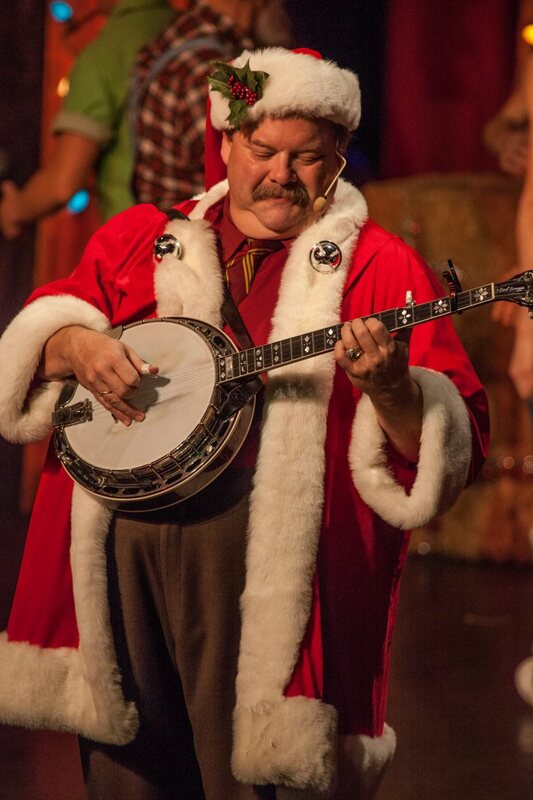 Photo: Mayor Timothy O’Reilly (played by Tim Harkleroad) on banjo. PIGEON FORGE, Tenn. (May 2016) – Where do trained pigs, parrots, housecats, dogs, a serval cat, a Burmese python, a kinkajou and a mini-donkey all perform together? The answer is at the new and original Amazing Animals Exotic Animal and Pet Show at The Comedy Barn Theater in Pigeon Forge, Tenn,, produced by The Fee/Hedrick Family Entertainment Group. Anthony and Alena King, their trained “amazing animals,” animal trainer “Professor Bumblemoore,” (Corkey Miller, Action Animals, USA) and her trained exotic pets perform in a hilarious new pet variety show at The Comedy Barn Theater at 2 p.m. on Tuesdays, Thursdays and Saturdays in Pigeon Forge, Tenn. The show opened May 21. The two-hour show includes zany comedy, animal antics and family fun for all ages. Ten high-diving housecats all perform in a comedy routine. They jump through hoops, move in a zig zag pattern, complete a high step routine, perform an Olympic pole balance, walk upside down, do super jumps, and even do a high diving stunt. In addition, pig stars Boris Bacon and Jessie Hamm compete with the audience in piggy games. The Kings have performed on Animal Planet’s Pet Star, The Tonight Show, at theme parks, festivals, fairs, pet expos, conventions and corporate events across the country, in Branson, Mo., theaters, and with The Comedy Pet Variety Show in Lakeland, Fla., as well as with the Royal Hannelford Circus. Miller has accumulated over three decades of experience working with exotic animals. She has traveled all over the United States and Canada. She has worked with Oprah Winfrey, Brendan Fraser, Sidney Poitier, Jack Hanna, Steve Irwin, Jim Fowler, Bill Murray, Robert DeNiro, Maya Angelou, John Cusack, Hulk Hogan and Dolly Parton, just to name a few. She’s been seen on The Today Show and Late Night with David Letterman several times. Her animals have been seen in hundreds of major motion pictures, thousands of commercials and print ads. All of Miller’s shows feature rescue animals that have found their “furever” home with her. Miller is a champion for the humane treatment of all animals and is a huge advocate for teaching children how to care for their pets properly. Also featured in the matinee show is magician/comedian Greg Franklin as goofy Farmer Klemm. A native of Kannapolis, N.C., Franklin has performed professionally since he was 16 when he landed a part in the Paul Osborne Merlin Rainbow Mystery Cavern Show just down the road at the site of what is now lost Treasure Miniature Golf in Pigeon Forge. Since then, he starred in his own magic show produced by Dallas-based Osborne at amusement parks all over America. He has owned his own magic store near Orlando, created a villainous professional wrestling character named “The fabulous Mister Franklin” and was appearing at The Carolina Nights Dinner Theater in Maggie Valley before coming to The Comedy Barn Theater. Open year round, The Comedy Barn Theater has two shows nightly throughout the year as well as some scheduled matinees for groups throughout the season. Tickets for the new Amazing Animals matinee show are $29.95 plus tax for adults and $9.95 plus tax for children ages 3-11. Guests may purchase tickets to either the Hatfield and McCoy Dinner Feud or The Smoky Mountain Opry at regular price and get a combo deal of $19.95 plus tax to add one, two, three, four or five additional Fee/Hedrick Shows including The Amazing Animals Show. In the combination package children are FREE per each paid adult ticket. Toll Free 1-800-29 LAUGH or (865) 428-5222. For more information, visit http://comedybarn.com/pigeon-forge-show/amazing-animals-exotic-pet-show. Pigeon Forge, Tenn., April 21, 2016 — Have you ever wanted to eat with the Hatfield’s of the famous Hatfield-McCoy feud? Now is your chance. Jack Hatfield will be visiting Pigeon Forge, Tenn., on Tuesday, April 26 and Wednesday, April 27 from 4:00 to 8:30 p.m. in the lobby of the Hatfield and McCoy Dinner Feud Theater to sign his Hatfield Clan Cookbook, “Eat’n with the Hatfield’s.” Books will be on sale at The Hatfield and McCoy Dinner Feud and the public is invited. Jack Hatfield has put together treasured family recipes used from the Hatfield clan. Inside this cookbook is a collection of recipes passed down through generations of direct descendants of The Hatfield Family (of the famous Hatfield & McCoy family feud) and friends. These recipes are a mixture of old and new recipes, some with a modern twist. There is also a collection of photos, facts, and stories about the family history throughout the cookbook. 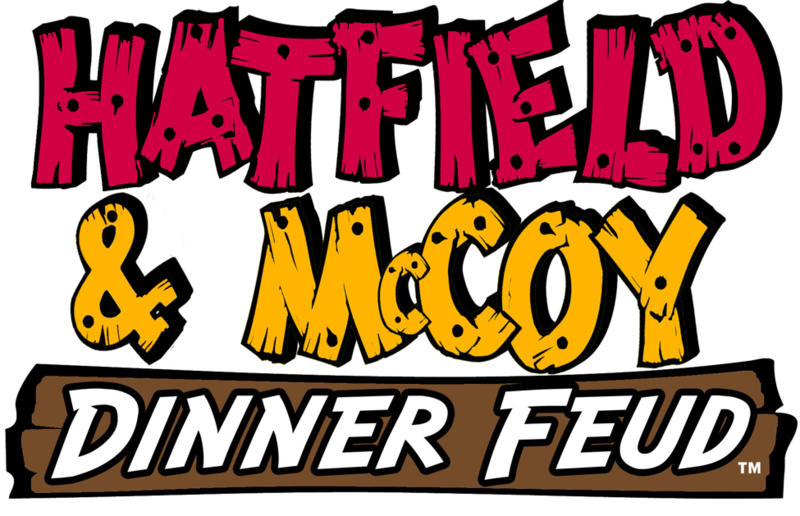 Show tickets are available for The Hatfield and McCoy Dinner Feud by visiting www.HatfieldMcCoyDinnerFeud.com or calling (865) 908-7469 (SHOW). The Hatfield and McCoy Dinner Theater is located at 119 Music Road between traffic lights 0 and 1 on the Parkway in Pigeon Forge between WonderWorks and the Titanic. This feudin’ show comes with a Granny’s ‘All You Can Eat’ mountain feast, served by a hillbilly waiter or waitress. Granny’s menu includes: Feudin’ Fried Chicken, Open Pit Pulled-to-Pieces Pork Barbecue, Southern Style Creamy Soup, Smashed Mashed Taters, Buttery Corn on the Cob, Ma’s Hot Homemade Bread, Daisy’s Blue Ribbon Coleslaw and Granny’s Famous Specialty Desserts. A vegetarian option is also available upon request. The Fee/Hedrick Family Entertainment Group, one of the largest show production companies in the southeast, also owns and produces other major shows in the Smoky Mountains including “The Comedy Barn®”, “The Smoky Mountain Opry™,” and “Magic Beyond Belief™” starring Darren Romeo. The Company also owns Happy Days Diner and SeePigeonForge.com, a vacation package website company. 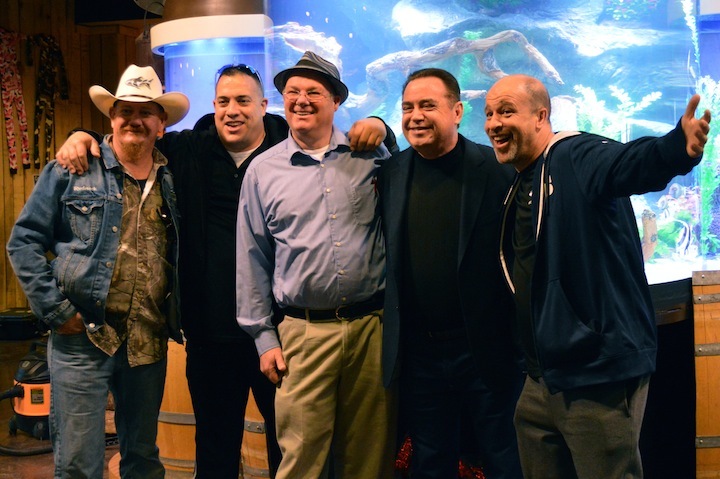 PIGEON FORGE, Tenn. (Jan. 13, 2015) – “The Hatfield and McCoy Dinner Show” will be featured on the television show “Tanked” this Friday, Jan. 16, at 9 p.m. on the Animal Planet Network as the season finale. The episode, titled “When the Moon(shine) Hits Your Eyes,” will feature an old moonshine still that was in the lobby of the theater and is replaced with an aquarium. Also shown will be scenes from the actual “Hatfield and McCoy Dinner Show” as well as the tank reveal to the cast members and to David Fee and Jim Hedrick, co-owners of the theater. Wayde King and co-host Brett Raymer (business partners and best friends) who own Acrylic Tank Manufacturers (ATM) in Las Vegas, host the popular TV series, seen each Friday night on Animal Planet. The two began the series four years ago. The reality show features King and Raymer traveling all over the world designing one-of-a-kind, custom-made outrageously themed fish aquariums. They have created tanks to look like pyramids, phone booths, cars, trucks and much more. Also featured in the show is Robert “Robbie Redneck” Christlieb. Spoiler Alert: The Jan. 16 episode will feature a 1,200-gallon fish tank in the shape of a moonshine still with a copper dome. Next to the still are two smaller tanks shaped like moonshine jugs. The tank weighs almost five tons. Inside the tank are more than 50 fish. The Hatfield family is represented by a species of fish known as a hi-hat, and the McCoy family is represented by the koi fairy wrasse. Other types of fish in the aquarium include surgeonfish, angelfish, puffers, snappers and what else, but triggerfish! It is a saltwater tank with a freshwater theme. When the tank was revealed, the cast, dressed in their show costumes, ran into the lobby to see the aquarium. Both families “hollered,” clapped, cheered and fired their guns, loaded with blanks, and then started to play their instruments. There was even a live pig named “Lou Lou” on hand that squealed with delight. Fee, president and chief executive officer of Fee/Hedrick and co-owner of the Hatfield and McCoy Dinner Show said, “We are delighted that the Animal Planet ‘Tanked’ TV series chose the Hatfield and McCoy lobby for their show. We encourage people to watch the show this Friday night and to stop by the lobby of our theater to see our moonshine still tank.” More than two million viewers will see the segment on Animal Planet. “The Hatfield and McCoy Dinner Show” is currently running and tells a hilarious story inspired by real life tragic events. The musical clogging show is full of comedy, romance, forgiveness and laughter with many twists. This approximately two-hour live show offers guests extraordinary country, bluegrass, and gospel vocal and instrumental musical performances, award-winning hillbilly musicians and cloggers and a huge mountain feast. The Fee/Hedrick Family Entertainment Group, one of the largest show production companies in the Southeast, is now in its 20th anniversary season. The show is part of the Fee/Hedrick Family Entertainment Group that includes “The Comedy Barn®”, the “Smoky Mountain Opry” and the “Blackwoods Morning Variety Show” featuring the Blackwoods. The company will open a new show, “Magic Beyond Belief,“ in March. The company also owns Happy Days Diner, Chef’s Catering and a website, http://www.seepigeonforge.com that helps guests plan their entire Smoky Mountain experience online.